So Lando: Double or Nothing #2 dives deeper into the adventure as Lando and company get into some serious trouble. Lando gets captured by pirates or something, L3 gets in line for the scrap heap, and Kristiss gets capture by the Empire. With good artwork, it should make for a good story, but unfortunately the writing is a bit of a disappointment. Now Lando probably isn’t the easiest character to write. There’s only three films to base his character off of, and there’s no less than two different actors playing two slightly different versions of him. 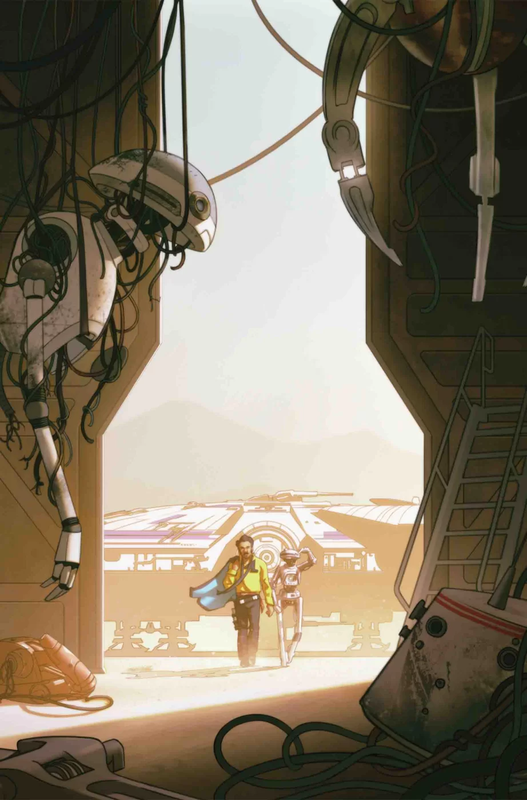 With this comic series taking place near the events of Solo, it follows the younger Lando, which we don’t have a lot of exposure to. This means the writer has to make more of a judgement call on how to write Lando. It can be hard to definitely say Rodney Barnes is writing Lando wrong, but in my opinion, he’s writing a terrible version of Lando. The character is shallow, obnoxious, and very hard to like. Even L3 isn’t all that likeable, which is a shame as I liked her in Solo. Kristiss doesn’t stand out that much, so there isn’t any characters in this series for me to latch on to. That’s pretty much the death knell for this story. I can’t get into it. I can’t really enjoy it. While the writing is disappointing, the artwork is good. Paola and Andres do a good job of bringing the imagery to life, adding some nice lighting and coloring, and capturing some of the over-the-top posturing of Lando. With Double of Nothing #2, this series is off to a bad start. It might work for some fans, but personally, I’m not liking it at all and I’m losing interest fast. I’m not sure this one can recover. I give Double or Nothing #2 a two out of five metal bikinis.